Day 0: 1800 hrs departure from Thap Lamu pier. Boat briefings and dinner on board as you cruise into the sunset. 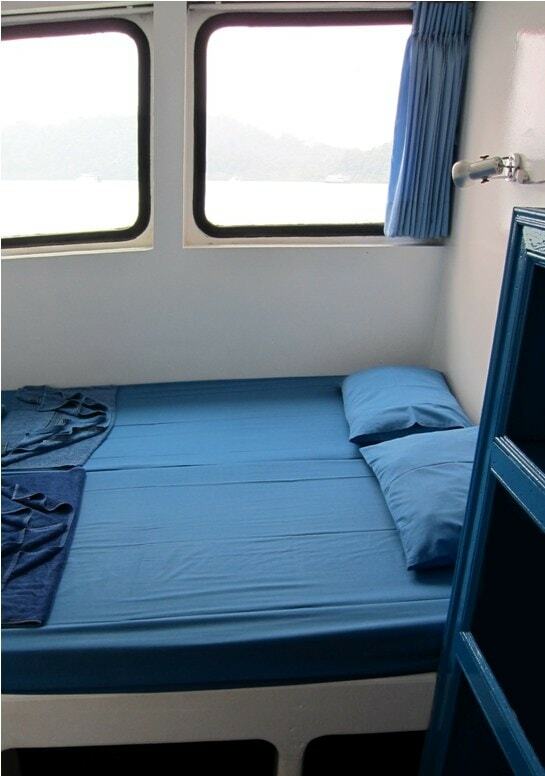 Arrive at Similan Islands and get a good night’s sleep in a sheltered bay to be ready for snorkeling in the morning. Day 1: Snorkeling at Similan Islands 4-7. Beach excursion. Overnight at island number 4. 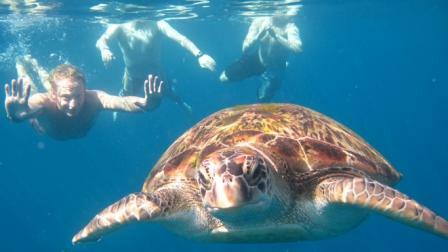 Day 2: Snorkeling at Similan Islands 7-9. Beach excursion. Overnight at island number 8. Day 3: Snorkeling at Similan Island 9 plus Koh Bon and Koh Tachai. Overnight at Koh Bon. Day 4: Snorkeling at Richelieu Rock plus Koh Tachai. Overnight at Koh Tachai. Day 5: Snorkeling at Koh Tachai and Koh Bon. Then Oktavia cruises back to Thap Lamu (may be with a little fishing along the way), arriving at about 1730 hrs for transfer back to your hotel. Day 2: Snorkeling at Similan Islands 7-9. Depart Oktavia at 1500 hrs for speedboat transfer back to Thap Lamu pier. Arrive Thap Lamu at about 1700 hrs and transfer back to your hotel. 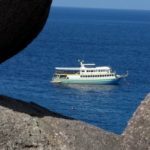 Day 1 (Day 3 of the 5 day itinerary): 0800 hrs departure from Thap Lamu pier by speedboat to the Similan Islands where you will meet up with Oktavia at 0930 hrs. Snorkeling at Similan Island 9 plus Koh Bon and Koh Tachai. Overnight at Koh Tachai. Day 2: Snorkeling at Richelieu Rock plus Koh Tachai. Overnight at Koh Bon. Day 3: Snorkeling at Koh Tachai and Koh Bon. Then Oktavia cruises back to Thap Lamu (may be with a little fishing along the way), arriving at about 1730 hrs for transfer back to your hotel. *Please note that there are no beach excursions on the 3 day trip. Koh Bon has no beach, Koh Tachai beach is amazing but unfortunately off limits for conservation. Richelieu Rock is just a rock. These are sample itineraries and are subject to change at the discretion of the captain and cruise director. 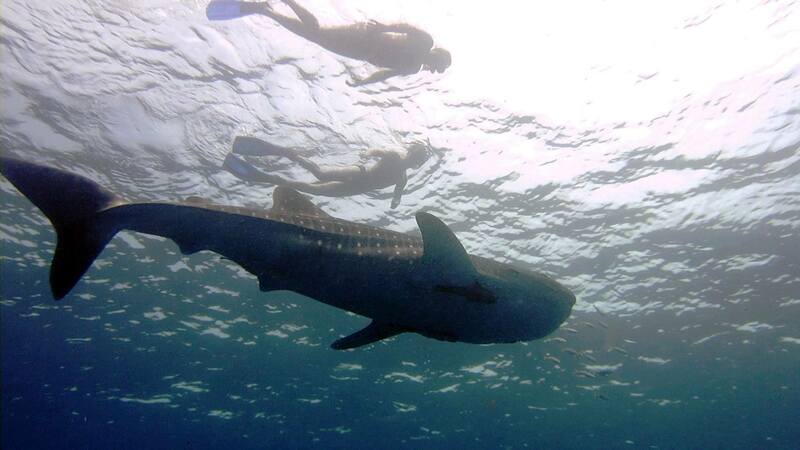 Included: Guide, all meals, fruits and snacks, snorkeling equipment rental. Excluded: marine park fees, alcoholic drinks, scuba diving. Transfers: Oktavia departs from Khao Lak, round trip land transfers by shared minibus are provided from hotels in Khao Lak main beach areas. For the evening departures round trip transfers from Phuket hotels can also be arranged for an extra charge. The 3 day 2 night itinerary departs Khao Lak in the morning and transfers from Phuket are not provided so please stay in Khao Lak on the evening prior to departure. Transfers can be provided to Phuket after the trip for an extra charge if required. One way speedboat transfer off the 2 day 2 night trip or onto the 3 day 2 night trip is included in the price. The speedboat cannot carry big bags so please just take the clothes you need for the 2-3 days in a small bag. Big luggage can be stored in the office until return. Prices for children: Discounts are available for children below 12 years old. For the 2 day and 3 day itineraries children must be 7 years or older. 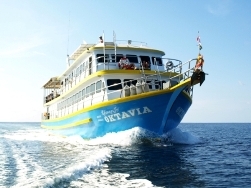 Oktavia takes a maximum of 20 guests in it’s 15 cabins. 13 standard main deck cabins. Twin bunk or double bed formation. 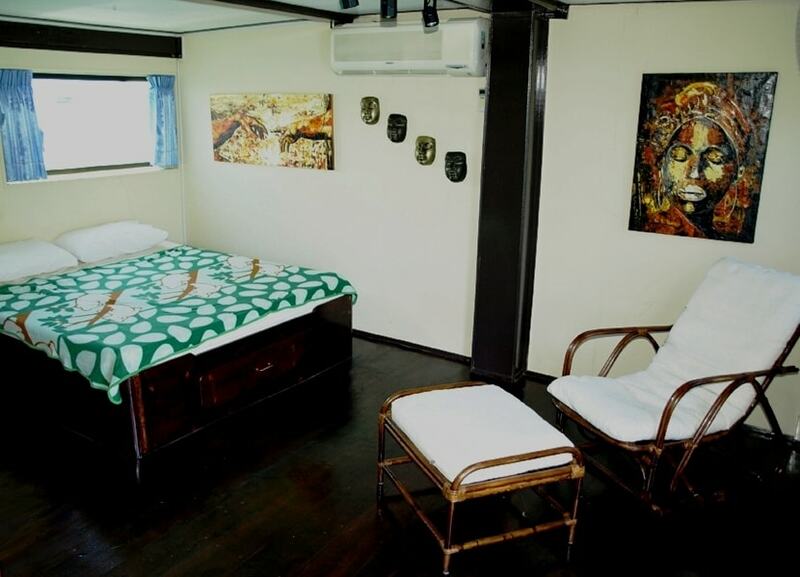 These standard cabins share 4 bathrooms on the same deck that are cleaned several times per day. 2 Master cabins on the upper deck. 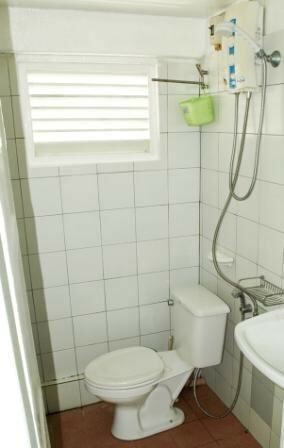 They have private en-suite bathrooms, a large double bed, LCD TV and minibar fridge. These cabins are huge (approx 25 sqm) and big enough to accommodate an extra mattress if you want to sleep a third person. All cabins have windows. Each cabin has air conditioning and fan cooling so you can get your cabin to the desired temperature. The cabins are light and airy. Beds are European size. All cabins have 220v electric outlets, mirrors, cabinets for hanging clothes, and storage space for luggage. Please contact us to check availability and make a booking. Snorkelers can sometimes feel like the poor relations on a dive boat but that’s not the case on Oktavia, they love snorkelers. There are dedicated snorkeling guides and snorkeling briefings with at least four snorkeling sessions per day at different reefs. MV Oktavia is a large, stable vessel, built in 2003 and refurbished by her Swedish owners in 2007. Her four decks provide lots of space for just 20 guests (she could take a lot more they owners prefer to provide space). Oktavia has a personal touch. The owners are usually on the boat to ensure everyone is taken care. Excursions to the Similan Island beaches are part of the itinerary along with impromptu games of beach football, nature walks and more. Beach visits are typically in the afternoon around 3 pm when the day trip speedboats go home so you get the beaches to yourselves. (Beach/island excursions are possible on the 2,4 and 5 day itineraries but not on the 3 day itinerary). Oktavia’s cabins are huge. 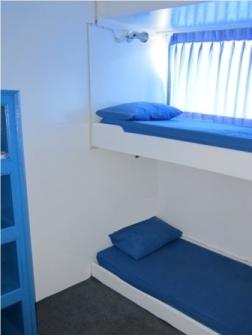 Beds are 2m long and even the single berths have wide mattresses ideal for bigger guests. Cabins have large windows giving a light and airy feel. 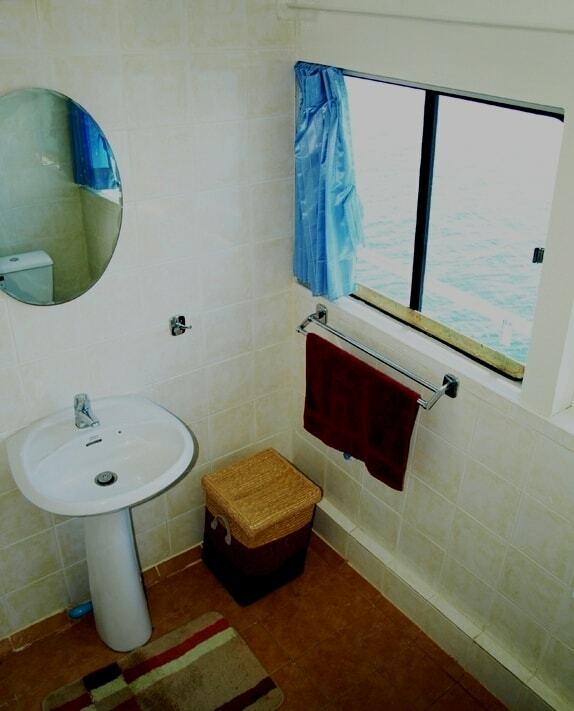 The master cabins are 25sqm. That’s bigger than some studio apartments! There is a large dining and socializing area on the upper deck aft. This is where all meals are served and dive briefings are held. It’s a great place to relax, snooze, read a book in the shade. There are comfy cushioned chairs and hammocks. The top deck has a large (65sqm) sundeck with cushions for sunbathing and a shaded fly bridge with comfy seating. 4.7m dinghy with 40hp outboard engine. Folding ladder for easy entry. Full safety features including fire extinguishers, smoke detectors, dinghy, life raft, life rings and life vests (including kids sizes), satellite phone, first aid box. 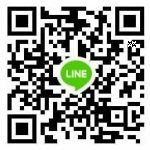 Hi Alan, There is 2d2n available 11-13 Dec or 3d2n available 14-16 Dec. After that there is a 5d5n trip 17-22 Dec then fully booked until 4 Jan.
Oktavia has one remaining trip this season. Dates are 21-25 April. 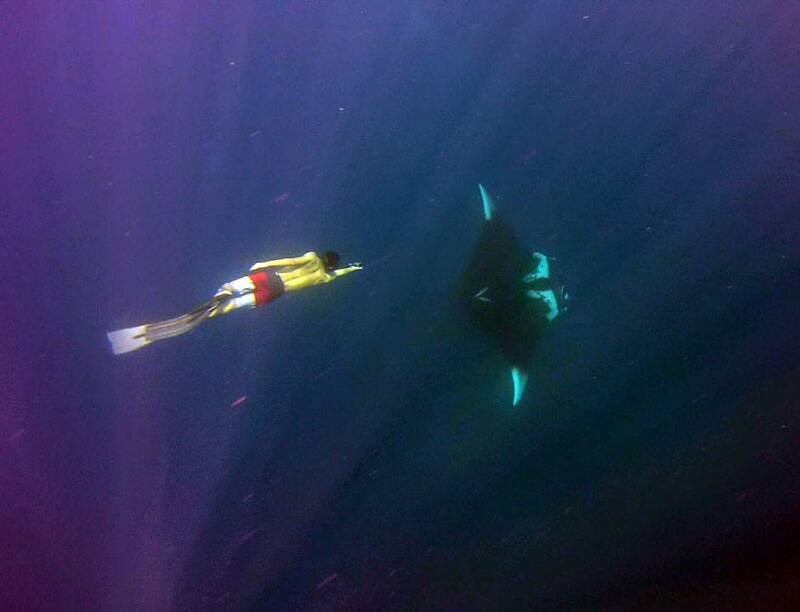 4d 4n to Similan, Koh Bon, Koh Tachai and Richelieu Rock. 17,925 baht per person. Do you have it available? I have to mention to you that I travel alone. I have my own snokling equipment if it’s necessary. Pease let me know as soon as possible. Hi Paul – Mary Duquin and Jack Patzer here. We did the 5 day trip with you in April this year and it was the highlight of our 5 month trip in Southeast Asia. We are coming back in January 2019 with our daughter and wanted to know what dates you have available in January for the 2 night 3 day trip. Jack and I would like the master cabin again and Shaelyn would take a single. Hope you here from you soon. We are a family of 5 with children aged 6, 8 and 15. We would like to go on a five day trip with Octavia in January. Is it ok for with you that we bring our 6 year old? She is a good snorkeler. Hi Jesper, yes a 6 year old can join. Prices are cheaper for infants and children. we are planning to be at Khao Lak from the 01/12/18 till 05/12/18, and we would like to do your 3d2n in a master suite. is there any spot available. The dates for Oktavia are 27 Feb to 1 March. Departure from Khao Lak is in the evening of Feb 27th. 15-20 Feb there are two master cabins available, standard cabins fully booked. 21-26 Feb there are standard deluxe and twin cabins available. Master acbins fully booked. 27 Feb-4 Mar all cabin types available. 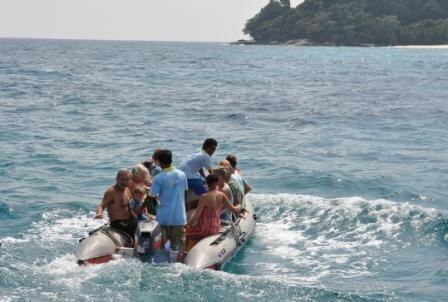 The boat departs from Khao Lak in the evening and returns to Khao Lak in the evening.